Hosts can control a multitude of options to prevent players from doing certain actions. Click on Options -> Options (secondary) to bring up the window. Please hover over the question marks (?) to read more about what each option does. In the General tab, there are some important features you can add to your games. Physics: There are 3 different physics modes you can choose from depending on the game and your play style. — Full: This is the default, normal mode with full physics. — Semi-Lock: Reduced physics. Semi-lock temporarily ignores the physics interactions. — Locked: Very minimal physics. There is no throwing, clumping, lowering, or pushing and objects will always auto raise in Locked mode. Snapping: Globally controls all object snapping. This is global, so if you want to control individual snapping, then you need to control it in the contextual menu. Gravity: You can even control the gravity of all objects. 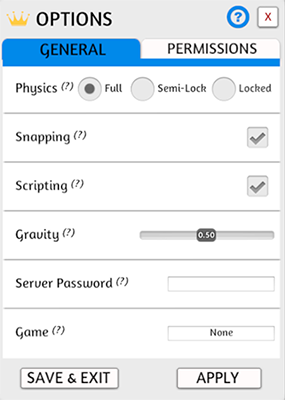 You can change the slider to determine the level of gravity you’d like. Server Password: Once you are setup in game and are hosting a server, you can go back into your options and change the server password (or add one if it was open), and change the name of your game that shows up in the Server Browser. In the Permissions tab, you can check/uncheck various options you don’t want people to use while in your server. Hover over each option to read the tooltip on each one. The host will always be allowed to use features that are turned off. Promoted players can still use some functions, as well as Game Masters. There may be more options added to this in the future. — Table Flip: Allows players to flip the table. — Contextual: Disables some functions of the contextual menu for players if unchecked. — Scaling: Allows players to scale objects. — Change Color: Allows players to change their color. Turn this off if you want to leave your server open, but don’t want people to choose a color right away. — Locking: Allows players to lock/unlock objects. 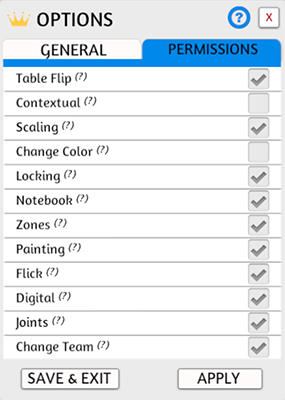 — Notepad: Allows players to use the Notebook and on screen Notes. — Painting: Allows players to use both the Vector and Pixel Paint tools. — Flick: Allows players to use the Flick tool. — Joints: Allows players to use the Joints tool. — Change Team: Allows players to change to a team.